Note: U.S. exports data for 2018 January through October; Norway 2018 exports data not yet available. U.S. exports of ethane have increased from nearly nothing in 2013 to an average of 260,000 barrels per day (b/d) through the first 10 months of 2018, accounting for about one-sixth of U.S. hydrocarbon gas liquids exports. Ethane is a key feedstock for petrochemical manufacturing. The United States became the world’s top exporter of ethane in 2015, surpassing Norway, the only other country to ship ethane internationally. 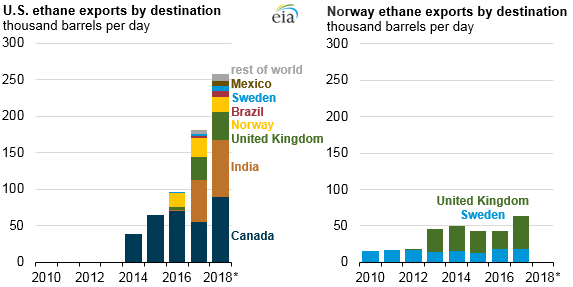 In 2014 and 2015, all U.S. ethane shipments went to Canada, but in 2018 the United States sent ethane to 10 countries. U.S. production of ethane, which is separated from raw natural gas at processing plants, increased along with development of U.S. natural gas shale resources. U.S. ethane production grew 74%, from an average of 1.0 million b/d in 2012 to 1.7 million b/d in the 10-month period from January to October 2018. During the same period, ethane consumed in the United States increased from 0.9 million to 1.5 million b/d, primarily because of new sources of demand and new infrastructure that allows ethane to reach consumers. The U.S. petrochemical industry, responding to greater feedstock availability and consequent lower prices of ethane on the domestic market, added capacity at existing plants and built new petrochemical steam crackers, resulting in an estimated $200 billion dollars of new investment across the country. Since early 2014, when the United States first exported ethane by pipeline to Canada, further infrastructure additions have enabled exports of ethane to grow and expand their geographic reach. Two more pipelines to Canada, as well as two marine terminals capable of shipping super-cooled ethane overseas, entered service in early 2018. Altogether, current U.S. export capacity totals nearly 450,000 b/d, and the United States now supplies ethane to Brazil, Canada, India, Mexico, Norway, Sweden, and the United Kingdom. Recent completion of the Utopia pipeline—from Ohio to Ontario—has facilitated more ethane exports to Canada, and ethane exports are expected to grow, along with the capacity of the Canadian petrochemical industry to process the ethane into ethylene at the Sarnia, Ontario hub. Additional export facilities in the United States are also either under construction or being planned. 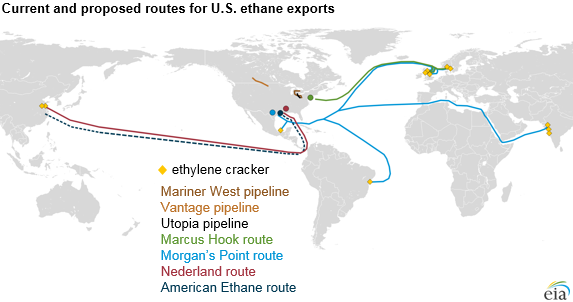 Exports of ethane from Marcus Hook are likely to increase once the Mariner East 2 pipeline, which will deliver ethane to the terminal, is complete. Energy Transfer Partners, parent company of Sunoco Logistics, is planning to build its second ethane export terminal along the Gulf Coast in Nederland, Texas. The Orbit Ethane Export Terminal, planned for completion in late 2020, will have the capacity to export 175,000 b/d of ethane overseas, with 150,000 b/d of that capacity already committed to Satellite Petrochemicals of China for its two newly built petrochemical crackers. Most recently, American Ethane, a Russia-funded enterprise, has broken ground on a 480,000 b/d ethane export terminal on the Neches River in Beaumont, Texas. The joint venture with Texas-based Martin Midstream Partners aims to supply ethane to a number of petrochemical crackers in China that are currently seeking government approval to begin construction.